Henry is quite resourceful with paper + staples. 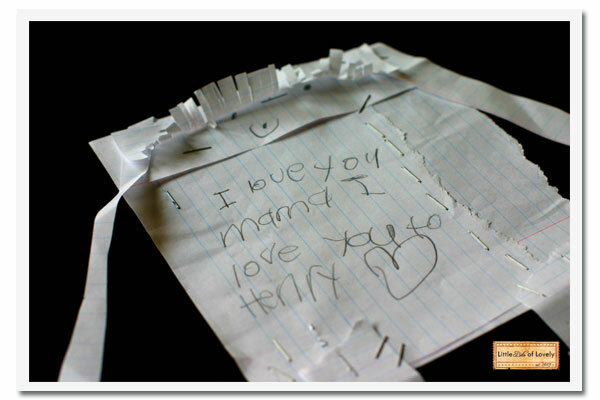 Last night while I was at a meeting, Henry got creative and created a paper version of his mama. I came home to find a mini-me, complete with bangs and a little love note. I cherish these little gifts and all the love that goes into them. Hello friend! Thanks for popping by! I'm Leslie. By day, I'm mama to three beautiful children and wife to one handsome husband. By night, I'm the owner and designer of The Paper Princess. I'm returning to the world of blogging after a long hiatus. Feel free to poke around my old digs, found here. This is a Flickr badge showing public photos and videos from ThePaperPrincess. Make your own badge here.